Stainless steel exhaust and muffler with dual oval exits, Catalytic converter and 2 lambda probes. 2 x 320 mm (12,60 in) semifloating discs, Radial Brembo monobloc 4-piston M50 callipers and radial master cylinder, Bosch cornering ABS as standard equipment. Riding modes, Ducati Safety Pack (Bosch cornering ABS + DTC), DPL (Ducati Power Launch), RbW, Cruise control, Hands-free, Full-led lighting with DRL*, Backlit handlebar switches, Bluetooth module, Infotainment system, Glossy black engine with machined belt covers, Premium seat, Machined aluminium mirrors. 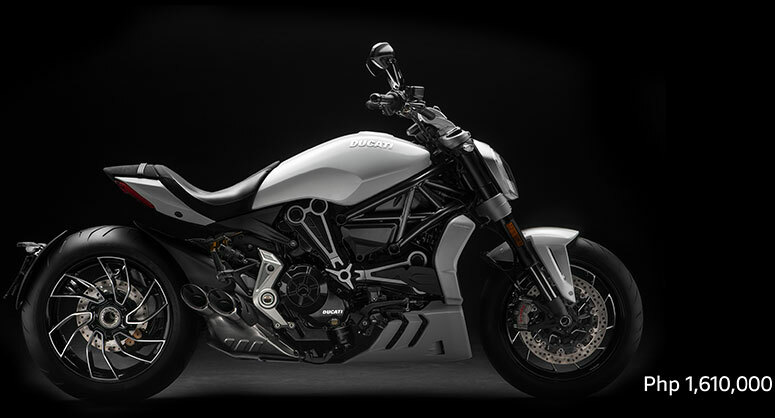 The XDiavel S comes with a Bluetooth module for the infotainment system which, by connecting a smartphone to the dashboard, can show incoming calls and text messages and show what music you are listening to.